We’re often asked for gift ideas that are “Pittsburgh themed“. Sometimes the shopper is buying for a co-worker or friend leaving the city or maybe they are traveling and want to bring something from their home town. Our most popular gift by far in this category is a piece from Riverside Design Group, a local company located in Lawrenceville, PA dedicated to sustainable design. They have created several beautiful collections, but Plates with Purpose tends to be the most popular as a “Pittsburgh” gift. Fifteen percent of the proceeds of any Plate with Purpose benefits various Pennsylvania (mostly in Pittsburgh) charities such as Habitat for Humanity, Family House, and the Greater Pittsburgh Food Bank. Although glass, the plates are packaged well and with some extra TLC (i.e. bubble wrap) from us, we’ve had many customers successfully transport their gifts tucked inside their luggage all around the world. A subset of this is a small collection called A Platter That Matters that is ONLY available through our store. 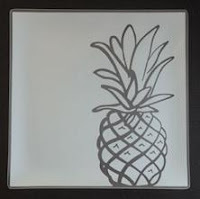 Inspired by Riverside Designs’ charity plates, we have partnered with select charities and Contemporary Concepts makes the donation to the designated charity (HEARTH, Down Syndrome Association of Pittsburgh). If your recipient is a Pittsburgh sports fan, we’ll likely prescribe a set of Pittsburgh Penguins Tervis Tumblers, or a Steelers Tervis Mug. 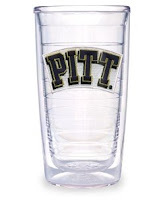 People LOVE their Tervis Tumblers which are perfect for hot or cold beverages and the double walled construction keeps drinks insulated longer! Got a big kid on your list, we usually have a selection of novelty Pittsburgh items like the boxing puppet in a Steelers jersey. Help keep someone’s Pittsburgh memories alive with one or more of our WQED DVDs about Pittsburgh like the “Things That Aren’t There Anymore” or “Kennywood Memories” DVDs. These would make a great gift for a family. One Response to Today’s Prescription: Pittsburgh gifts! >this is an unique glass gifts ideas..this is a nice post..thanks for this nice post..